Police are trying to identify members of a flash mob involved in a brazen crime caught on tape in Montgomery County. The surveillance video obtained by NBC Washington shows a flash mob virtually taking over a 7-Eleven in Germantown, Md., at about 1:45 a.m. Saturday. Mohammad Jebanzeb, the store owner's son, told NBC Washington almost three dozen young people walked in grabbed candy, sodas, ice cream and other items, and then walked out without paying after about a minute. The video showed many of those involved laughing and smiling while stealing from the store. 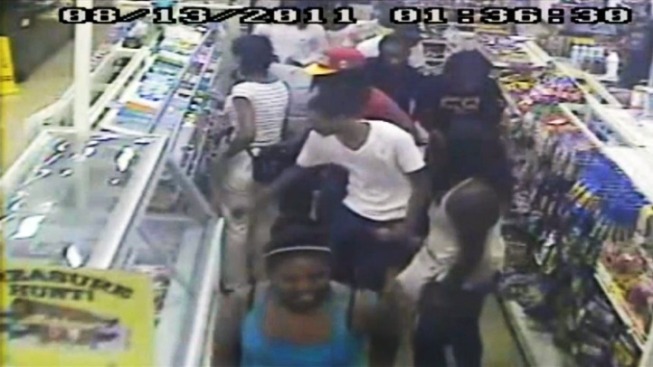 The clerk called police but by the time officers arrived the mob had left. Police said they would check social media sites like Facebook and Twitter to see if any of those involved posted videos. Several suspects have been identified from the surveillance video. If you recognize anyone in the video, call Montgomery County police at (301) 279-8000.